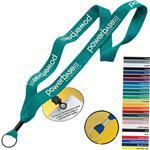 A great promotional lanyard at a great price. 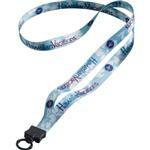 This custom printed cotton lanyard is a nice width to easily display your logo or other company information. Use for trade shows or for employee security. 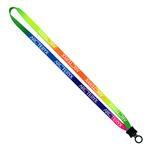 1/2" knitted cotton lanyard with metal crimp and standard rubber O-ring attachment. Provide your customers extra use features by adding a split ring, bull dog clip or velcro release! Need to see other options? Call our staff at 888-332-ADCO. 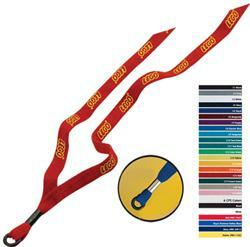 FOR LANYARD ATTACHMENT OPTIONS, CLICK HERE - SEE TYPE A LANYARD ATTACHMENTS! Available Colors: Black; Burgundy; Electric Blue; Forest Green; Gold; Gray; Lime Green; Navy; Orange; Pink; Purple; Red; Royal; Tan; Teal Blue; Teal Green; Turquoise; White; Yellow. Dimensions: 1/2" x 16" on each side. Typical Imprint Area(s): 3/8" x 12" - front side; left + right panel. Available Imprint Options: Add $0.26 running charge for each additional imprint color. Approx. 4 lbs. / 100 ct.